Make an impression when you arrive at your wedding in a 1968 Ford Mustang Convertible with Pop A Cork Tours. Enjoy the freedom that a convertible offers and the distinctive sound of a Windsor 351 V8 purr for impact. 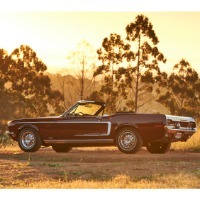 Being available for photo shoots, our Mustang will make a classic contribution to any photo. As a husband and wife team, we own and operate Pop A Cork Tours from the Bunbury Region. Cruising 7 days a week, for weddings throughout the Bunbury Geographe and Margaret River regions. Contact Lisa or Tony and we look forward to providing you and your party with an unforgettable experience.